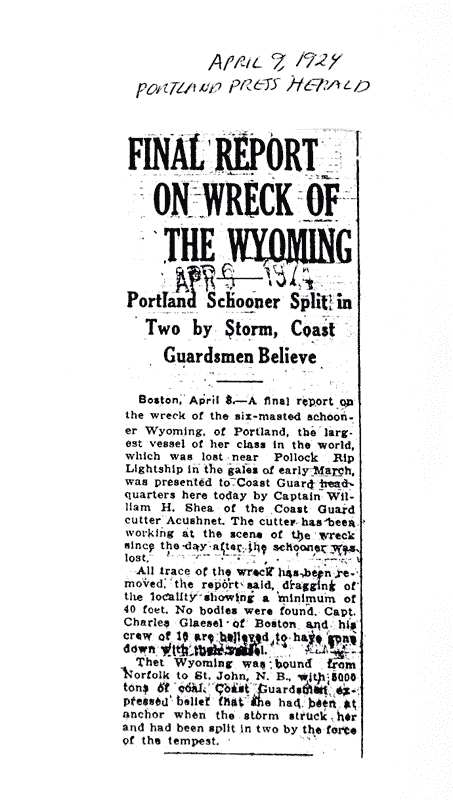 and the reports of the great Wyoming lost at sea. 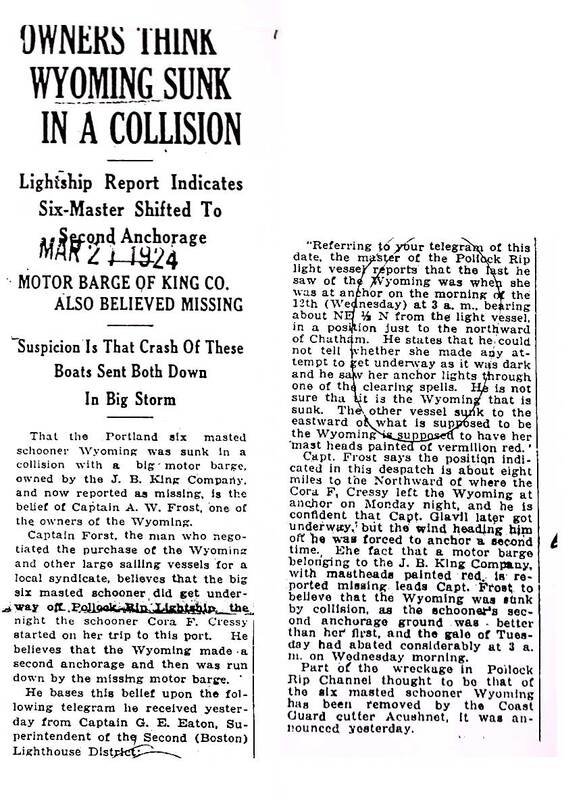 First Mention of the Wyoming being lost. "Fresh NW to strong NNW breeze; partly cloudy to clear. 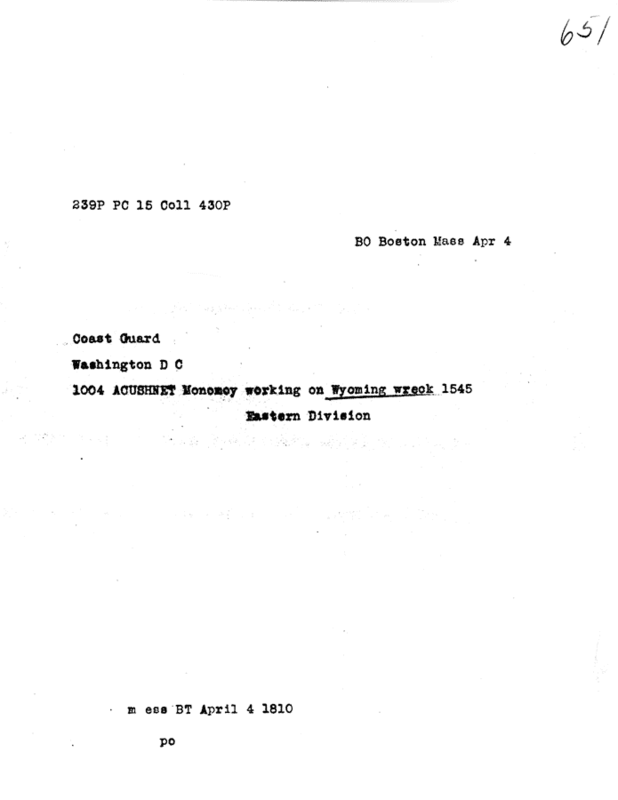 4:03, moved to wharf Woods Hole. Secured. 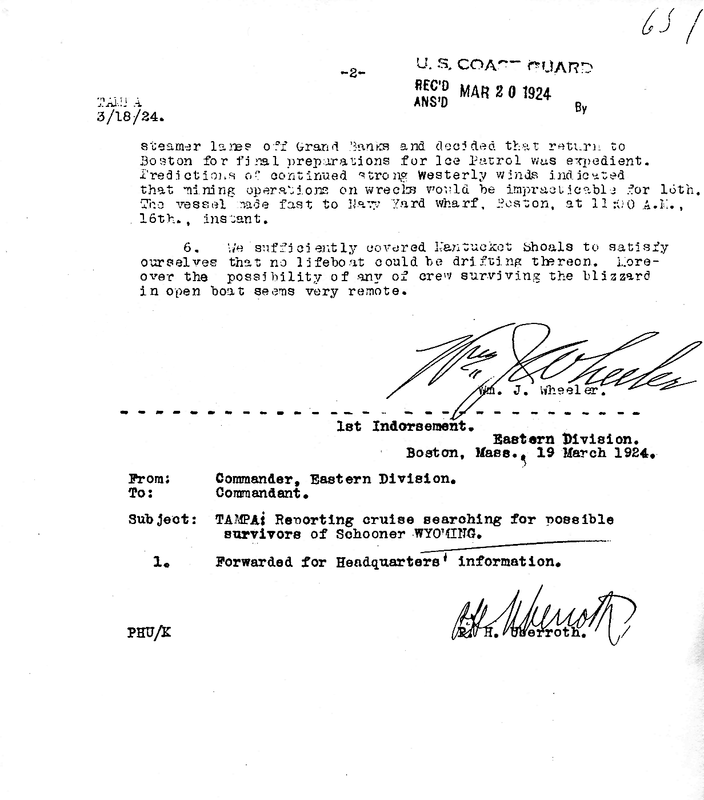 Honorable discharged James G. McCarthy, JK3C at expiration of full term of enlistment. discharge # 29694. Paid by Chief. 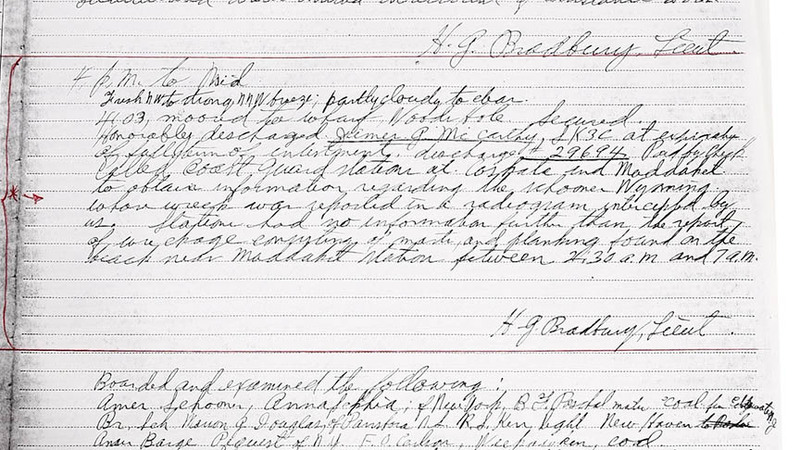 Called Coast Guard station at Cospale(sp) and Madaket to obtain information regarding the schooner Wyoming, whose wreck was reported in a radiogram intercepted by us. 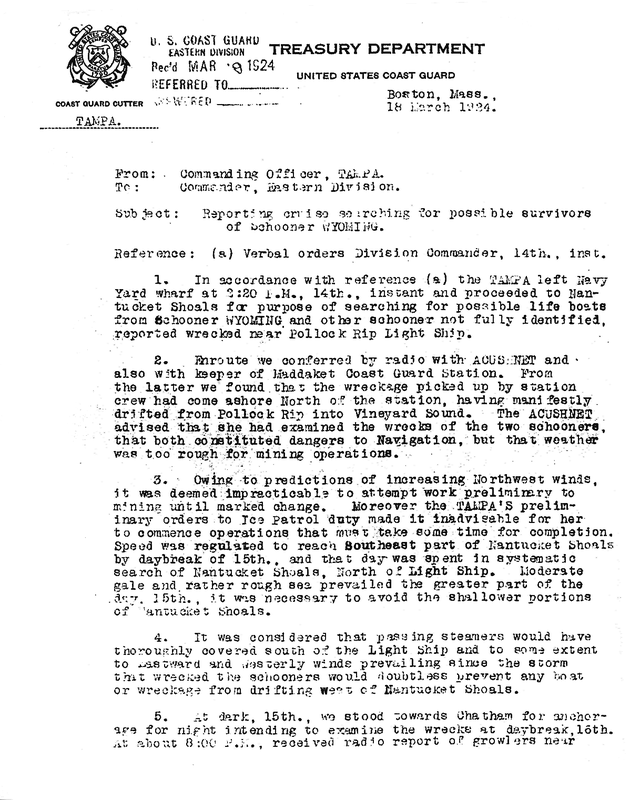 Station had no information further than the report of wreckage consisting of masts and planking found on the beach near Maddahet station between 4:30 a.m. and 7 a.m." - H. G. Bradbury, Lieut. 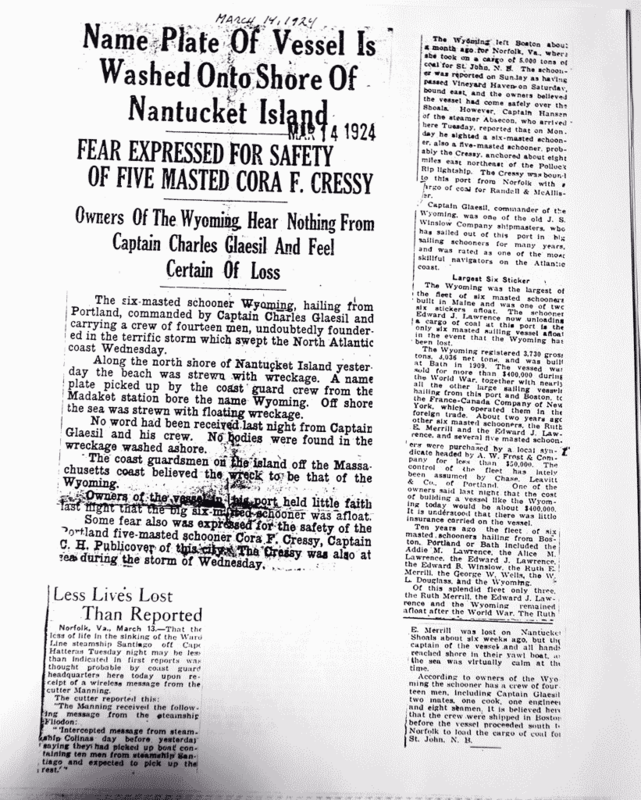 Unknown Newspaper -"Name Plate of Vessel is washed Onto Shore of Nantucket Island"
"Fear Expressed for Safety of Five Masted Schooner Cora G. Cressy"
"Owners of the Wyoming Hear Nothing From Captain Charles Glaesel and Feel Certain of Loss"
Gentle WNW to NW breeze, to strong N breeze, partly cloudy ; slight NW sea; heavy swell. 4:15 P.M. Sighted Wreckage to eastward of Pollock Rip light vessel. 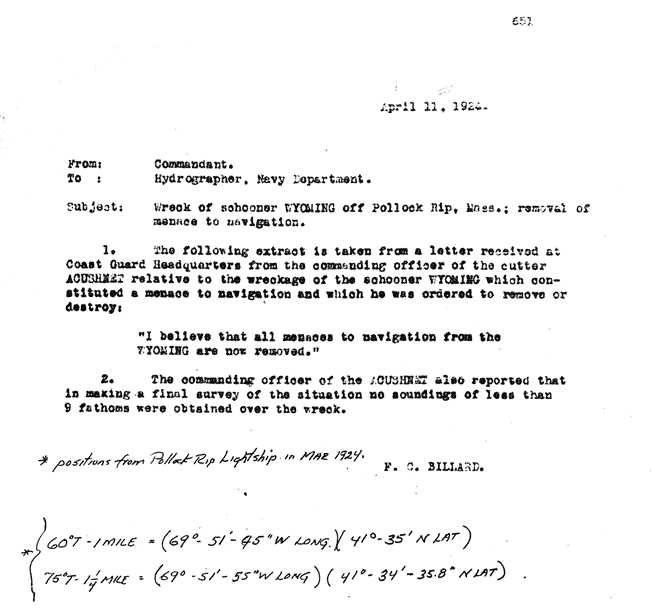 4:22 P.M. Pollock Rip light vessel abeam; stood over to wreckage on various courses at various speeds. 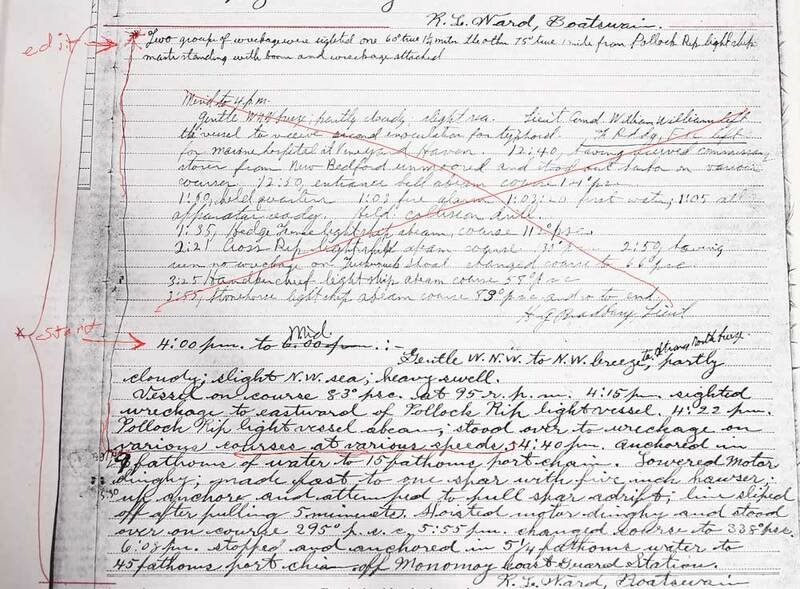 Two groups of wreckage sighted, one 60 degree true 1 1/4 miles the other 75 degrees true 1 mile from Pollock Rip Lightship, masts standing with booms and wreckage attached. 4:40 P.M. Anchored in 9 fathoms of water to 15 fathoms port chain. Lowered motor dinghy: made fast to 1 spar with five inch hawser. 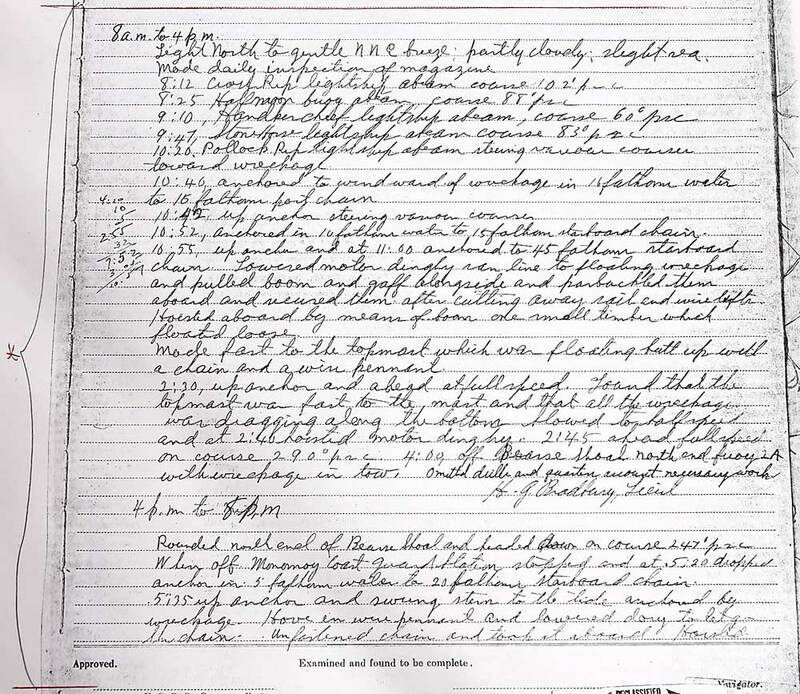 5:30 up anchor and attempted to pull spar adrift; line slipped off after pulling 5 minutes. Hoisted motor dinghy and stood over on course 295 degrees. 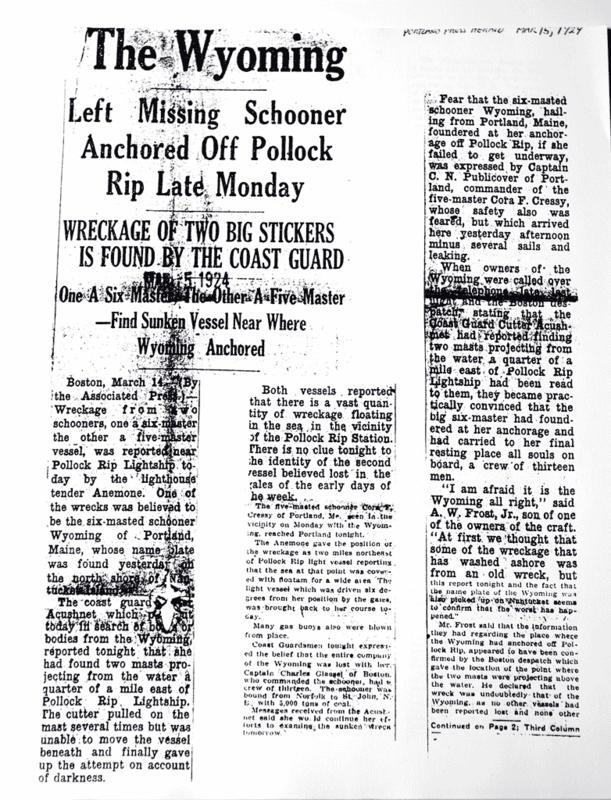 Portland Press Herald - The Wyoming "Missing Schooner Anchored Off Pollock Rip Late Monday"
" Wreckage of Two Big Stickers is found by the Coast Guard"
"One A Six-Master, The Other a Five Master - find Sunken Vessel Near where Wyoming Anchored". 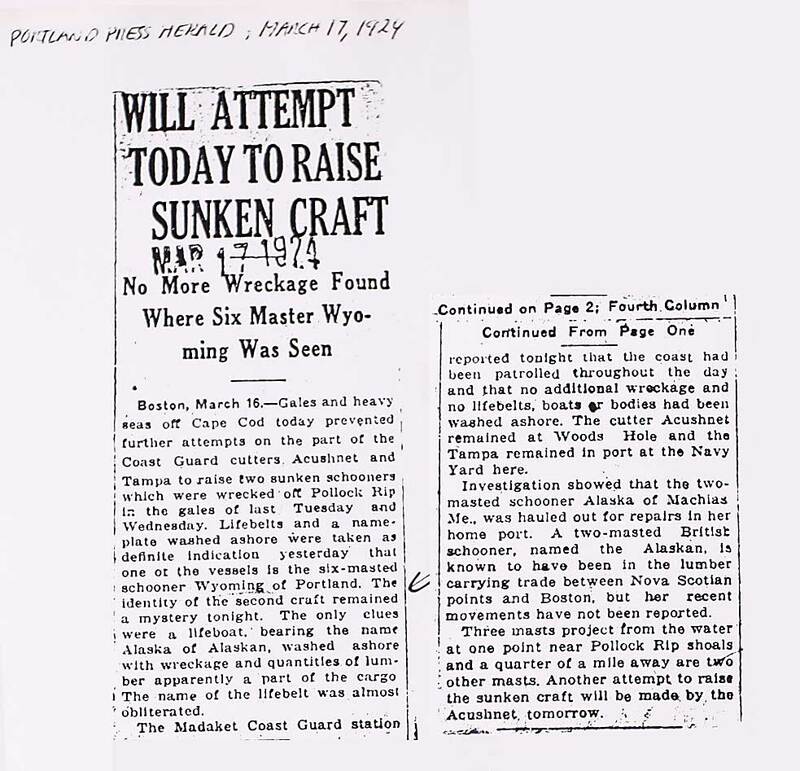 Portland Press Herald - "Life belts of Wyoming Found; All Hope for Vessel is lost"
"Discoveries By Acushnet Bear Out Previous Evidence Of Disaster - Jinx Following Six Master Recalled By Sinking"
Portland Press Herald - "Will Attempt Today to Raise Sunken Craft"
"No More Wreckage Found Where Six Master Wyoming Was Seen"
USCG Tampa sent to investigate and search for survivors of the Wyoming and a possible second schooner that went down in the storm near Pollock Rip Light ship. 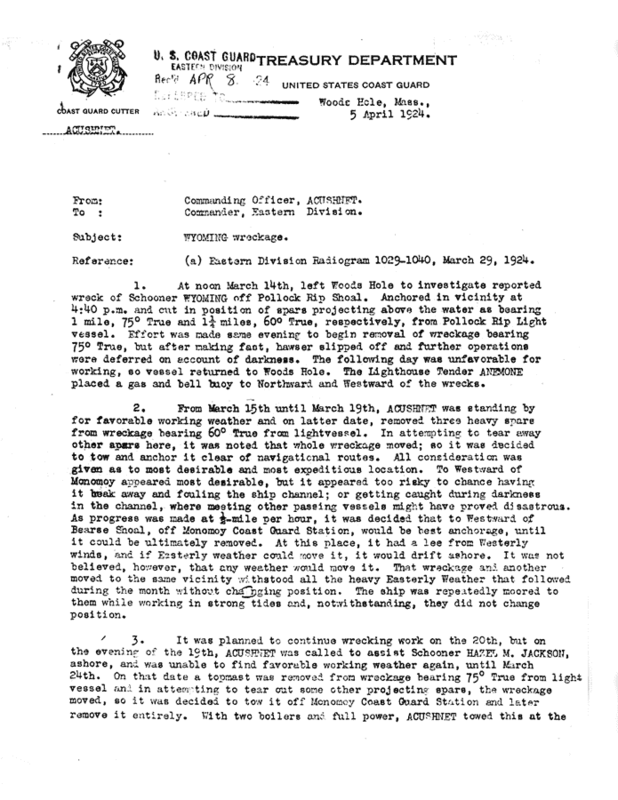 Report from the Tampa. 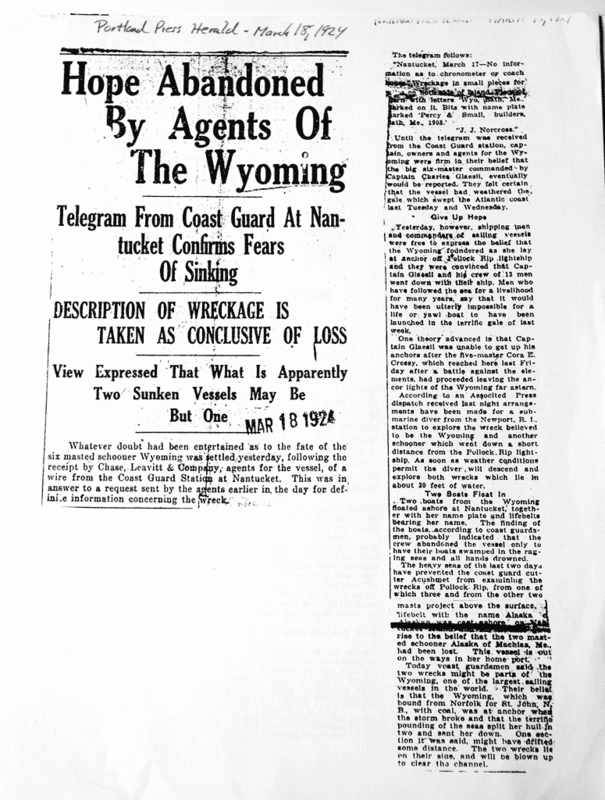 Portland Press Herald - "Hope Abandoned By Agents of the Wyoming". 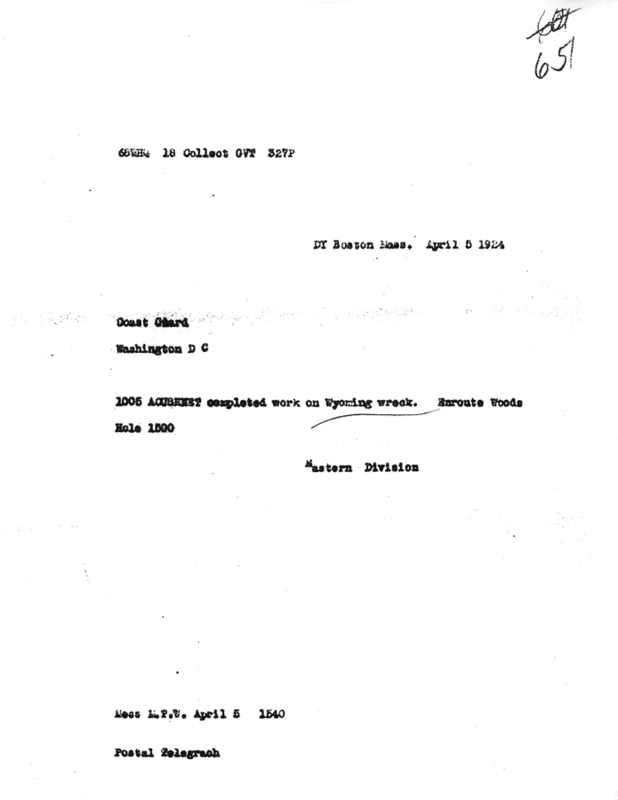 "Telegram from coast Guard at Nantucket Confirms Fears of Sinking". 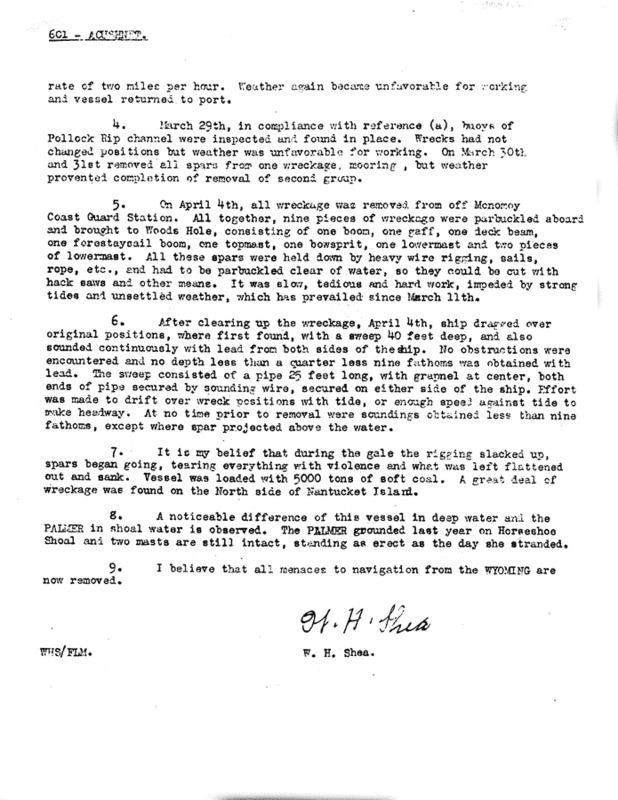 Portland Press Herald - "Owners Think Wyoming Sunk in a Collision"
"Lightship Report Indicates Six-MAster Shifted To Second Anchorage"
Coast Guard Acushnet Report - From the Commanding Officer of the Acushnet to the Commander of the Eastern Division, USCG; describing the events from March 14th to April 4th to search for survivors, investigate the wreckage and remove any potential hazards in the shipping lanes. 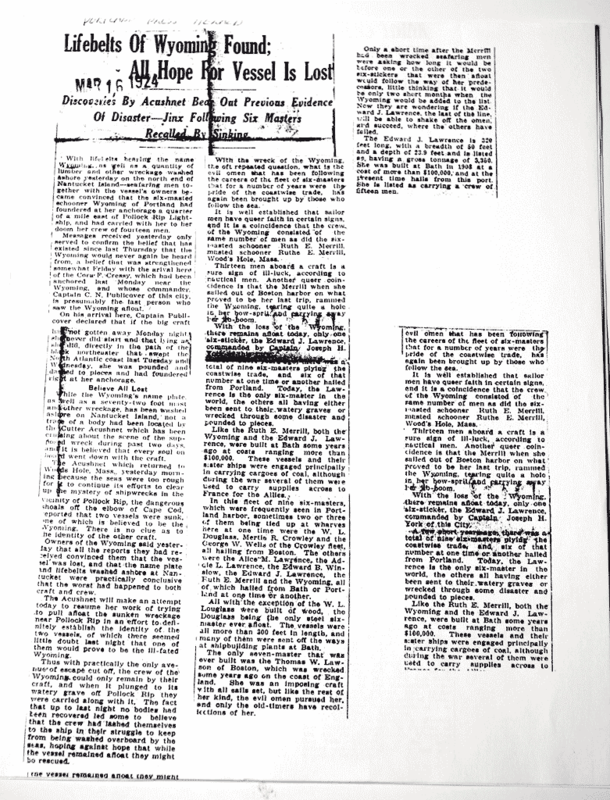 Unknown Newspaper - "Final Report on Wreck of The Wyoming"